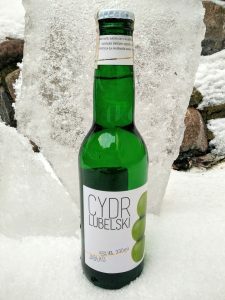 CYDR LUBELSKI (its name can be translated as Cider from the city of Lublin or Cider from the region of Lubelszczyzna) is one of the most popular ciders in Poland. During our last visit to Poland, we decided to check how it tastes. We bought several bottles at once (it is sold in different flavor varieties). Natural cider made with freshly squeezed juice from ripe, Polish apples. Made in a natural way, the same as for sparkling wines – fermentation straight from pressed apples. It has a rich, refreshing taste. It is fresh, very light, full of natural bubbles and healthy. Moreover, the producer emphasizes that the Polish ciders must contain 60% of the apples. Our impressions: The first surprise is its color, very bright, transparent, even lighter than white wine. Immediately occurred the question: why so bright? It has a pleasant, fruity fragrance. It tastes good (not too sweet) and it is lightly carbonated.